William P. Reckeweg, the son of William and Helen Reckeweg, was born in Audubon, New Jersey on September 3, 1916. He graduated from Audubon High School in 1933 and entered Dickinson College where he played baseball, football and soccer. Reckeweg joined the Insurance Company of North America as an insurance agent following graduation from Dickinson, and enlisted in the Army on February 8, 1941. Reckeweg took basic training at Fort Indiantown Gap, Pennsylvania and completed Officer Candidate School at Fort Benning, Georgia in August 1942. He was later at Camp Breckenridge, Pennsylvania and Camp Van Dorn, Mississippi before attaining the rank of captain. 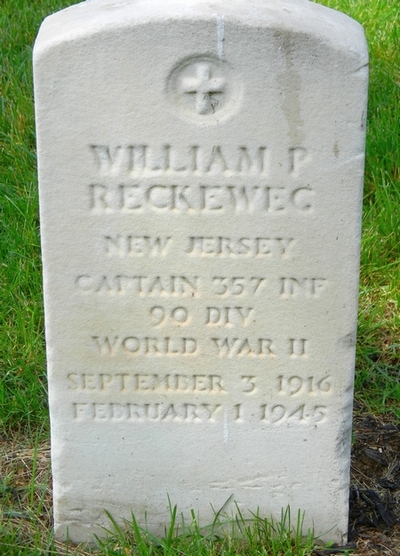 Captain Reckeweg was sent overseas in 1944 and took command of Company C, 357th Infantry Regiment, 90th Infantry Division. He landed at Normandy on June 11 and was wounded on July 5. He spent six weeks in a hospital in England and returned to active service with his unit in September. On February 1, 1945, Captain Reckeweg was in northern Luxembourg, using an old barn as his company command post. An enemy artillery shell hit the barn and Reckeweg was killed instantly. His body was brought home after the war and buried at Beverly National Cemetery in Beverly, New Jersey on April 20, 1949. Some of the above information was obtained from dvrbs.com and the Dickinson College website.